Pirates of the Caribbean: Dead Men Tell No Tales ~ Our impression, downloadable activities, and more. To celebrate the upcoming release of Pirates of the Caribbean: Dead Men Tell No Tales, coming to theaters this Friday May 26th, 2017, we were provided with some materials to create a 'treasure chest' and share with our audience some of our precious treasure. All of these are materials that you can find at your local craft store, so if you like the idea, and would like to make a treasure chest of your own, I totally encourage you to do it. It is a great family activity, which will allow your little ones to learn about some of the important things in your lives as a family, and it is a great experience to share the things you hold dearly, which may be more precious than gold. When using paint and/or wood stain, be sure to do it in a well ventilated area, as fumes from the paint can be toxic. If you prefer to paint your treasure chest with natural colors, there are tons of recipes online that you can get. I believe that vinegar and pennies in a jar can create a nice aqua tint that you may like, although coffee stains brown and that is the color you want if your treasure chest is meant to look the traditional way. When you paint wood, always paint in the direction of the lines in the wood. If you are going to use a hot glue gun to embellish your project, please do so carefully. Even the most skilled craters have ended up with battle scars. Just be cautious, or look for alternative gluing options. First get some material: A wooden chest or box, Rhinestone gems, Wood Stain, Acrylic Paint, Glue, and different brushes. Carefully and in a ventilated area, stain your wooden box. Then let dry. Once it is dry, mix some gold acrylic paint with some black acrylic paint, so that the gold tone gets a bit darker. You can control this and make it as dark as you want. You can also do this in silver, or just gray to simulate iron. I wanted gold. You can also use this paint to accent the stained part--shiny! Once it is dry, you can embellish your 'treasure chest' with gems or anything you want. I used a glue gun. If you decide to use one too, be careful not to burn yourself. You can find alternative glue options in your local craft store. Finally, add your treasure and enjoy! While some of these items are jewels and silver, which would be a common pirate's treasures. There are other items that are more valuable than gold, because of the sentimental value, most of which have been given to us by our grandparents, parents, and/or represent something important in our lives. From left to right, and below the treasure chest, you see a couple of dried roses. Those are from the flower arrangements from our wedding. To the right and above, there is a mermaid-carved medallion, which was the first Christmas gift I got from my husband when we were boyfriend/girlfriend. I love mermaids, and that is why it is important. To it's right, there is a ring. This ring is the one my husband used to proposed. The blue of the stone, and the vines of the filigree represent the fountain in the rose garden, where he left me speechless after proposing, which is also the location in which we got married. The red gem next to the ring, was inside the flower arrangements for our wedding too. Next to that, there is a bluish crystal in the shape of a teardrop. This crystal is called 'Aventurine'. When you look at it, it looks like the starry sky, and my childhood dream of being an astronaut. Even if I didn't become one, I am the happiest when I look at the sky. This crystal is like wearing the sky, it's awesome! Below it, there is a Pleiadian medallion that my husband got me, because that is one of my favorite constellations. To the right of that, there is a little pearl bracelet. This represents my grandmother, because she loved pearls. Then you see two pairs of glasses. This is my most precious treasure, because those are from my grandparents. I get to hold something they used to see the world. The crystals below the glasses, and below the silver coin, are part of my crystal collection, which my grandmother started, and which has been growing a lot thanks to all my friends who bring me little stones or crystals from around the world. Doesn't really cost them much when they get me one, but the stories behind where they got them are always very cool. These two were bought in Colorado as a birthday gift to me. I love them! The little elephants were my grandmother's and now they are mine. It is said that the elephants that have their trunk up bring good luck. The crystal spiders were a gift from my husband's maternal grandmother. They represent the first Christmas we spent as a family in Santa Maria, CA, plus there is a lovely story behind why people place spiders on the Christmas Tree. Not only that, but when we got married, it was the day after Halloween, and part of my husband's family (Grandparents, Mother, Aunts, and Uncles) dressed like witches when I met them, it was awesome! I guess we love our Holiday spirit. The Silver coin next to the spiders, was a gift from my husband's grandparents too. As they say: "It is good to have an investment." Just the lesson in itself is a treasure in itself. The silver bracelet next to the coin to the left, with the baby boy profile, is a gift that my mother-in-law gave her mother, when my husband was born. Many springs later, Grandma gave it back to her daughter as a keepsake, and my mother-in-law gave it to me for when we have children. Lastly but not to say the last of our treasures. The heart hair clip and the heart bracelet, were from when I was a very young kid. Somehow I always kept sentimental value with them, and whenever I see them, I am magically transported back in time to every single occasion I was wearing it. It's incredible how the mind works. These and the Mickey pin, are reminders of the magic that lives within our hearts on never growing up. My mom always tells me the story on how I was "almost born in Disneyland", because she was about to get in the roller coaster when she was 8 months pregnant of me. Yeah right, anyways, that's her story. Funny thing is that I have never gone to Disneyland, but I am sure it will be a magical adventure to share with my kids, and the pin reminds me of that. OH and well the leather diary. It doesn't fit in the wood chest, but, someone has to tell the life adventures of our family right? That way, they will never be forgotten and always treasured for many more generations to come. So what would you treasure in a Pirate Treasure Chest? Let us know in a comment below. By the way, we already saw Pirates of the Caribbean: Dead men tell no tales, and we super enjoyed it. Want to read our impression? Just keep on reading. You can also find some free activity sheets below our impression, and the final trailer of the film alongside movie info (in English and Spanish). Last Monday, we were honored to assist an advanced screening of Pirates of the Caribbean: Dead Men Tell No Tales, courtesy of Allied Contigo. This is the fifth film in the franchise, and let me tell you that we had so much fun. Since we are very familiar with the adventures, or rather said "peculiar situations", in which Captain Jack Sparrow tends to get himself into, we knew before hand that we were going to have a great time watching him try to get out of yet another "complicated" scenario. This film goes into the background story of Captain Salazar (Javier Bardem), who portrays a broken soul looking for vengeance, as most ghost tend to, and how his curse came to be. I have to confess that I was really looking forward on Javier Bardem's performance, and I can say for sure that I really enjoyed it. Although the story of Salazar did not start on the murky side of the sea, I must say that he does a marvelously scary villain. There're also new faces that you will enjoy in this film, proving once more that this franchise can just go on for generations to come, keeping the audience engaged and thirsty for more treasure-hunting adventures. Once you get to know the story behind the newest members of Captain Jack Sparrow's crew, you will learn why these character's presence is of critical importance to the storyline--believe me when I say, you are in for a surprise. I don't want to spoil this movie much for you, but as the story develops, you will learn that not everything is what it seems, and secrets will unfold. In my opinion, this story is very well told, to the point that it carries your intrigue further and further as you try to understand the whys and hows of certain events, without it diverting far from the stories from previous films in the franchise. Again, trying to avoid spoiling the movie for you. In other words, this is a movie with; humor, thrilling action sequences, superb special effects, top of the line performances, a bit of romance, scary villains, secret maps and treasure to die for, big boats, beautiful scenery, swords, canons, and loads of rum. With that being said, expect the thematic expression of the franchise to be present throughout the film. Nevertheless, this film does mark differences that will captivate your imagination. We watched this movie on IMAX 3D. This allowed us to enjoy the fantastic scenery as though we were part of the film. With the exception of the sharks, because I am completely terrified of them, I totally loved this film--I can still hear the theme song in my head, which I have been humming over and over since we saw the movie last Monday. Nonetheless, there was a scene in which I jumped off my seat weaving my hands like a crazy person for a couple of seconds, but that is what happens when you mix zombie-like sharks, outstanding special effects, and 3D. Then again, that could just be me, and my phobia to sharks. Well, what was I expecting, right? It's a pirate's movie! All in all, I totally recommend this movie for the whole family! So if you arrrrrr a mighty brave pirate, I dare you to walk the plank (in a figurative manner of speech), watch the movie, and tell us what you think in a comment below. One more thing, when you go see Pirates of the Caribbean: Dead Men Tell No Tales, and before you set sail. There is a post-credit scene at the end of the film, so don't rush out of the movie theater once the credits start. You might miss on some goodies. Pirates of the Caribbean: Dead Men Tell No Tales will arrive to theaters across the United States on May 26th, 2017, and we really hope you enjoy it as much as we did. This blog post is brought to you by Allied Contigo and Pirates of the Caribbean: Dead Men Tell No Tales (#PiratesLife). Look at these super cool collectible figurines and movie merch we got. Thank you Allied Contigo! See, now my tiny Captain Jack Sparrow, can defeat the Kraken! Okay, it's a giant octopus, but that is why we use our imagination (I already owned this toy, not part of the movie merch). Who will you be watching this movie with, and who is your favorite pirate of the franchise? Let us know in a comment below, we'd love to read you! If you were a pirate, what would be your pirate name? Just a couple of days, and you'll be able to enjoy this exciting and fun family film. Remember to follow us to be up-to-date with the latest in family films like this one. Until next time, smile--because it's contagious! Johnny Depp regresa a la pantalla grande como el icónico e intrépido antihéroe Jack Sparrow en la nueva película Piratas del Caribe: La Venganza de Salazar. Esta animadísima aventura encuentra al Capitán Jack pasando por una mala racha, con la sensación de que los vientos de la mala fortuna soplan fuertemente en su dirección cuando los letales marineros fantasmas, liderados por el aterrador Capitán Salazar (Javier Bardem), se escapan del Devil's Triangle empeñados en matar a todos los piratas del mar, en particular, a Jack. La única esperanza que tiene Jack de sobrevivir yace en el legendario Trident of Poseidon, pero para encontrarlo debe formar una incómoda alianza con Carina Smyth (Kaya Scodelario), una brillante y hermosa astrónoma, y con Henry (Brenton Thwaites), un joven y decidido marinero de la Marina Real. Al timón del Dying Gull, su lastimoso barquito gastado, el Capitán Jack procura no solo revertir su reciente aluvión de mala fortuna, sino también salvar su vida del enemigo más formidable y maligno al que se haya enfrentado. 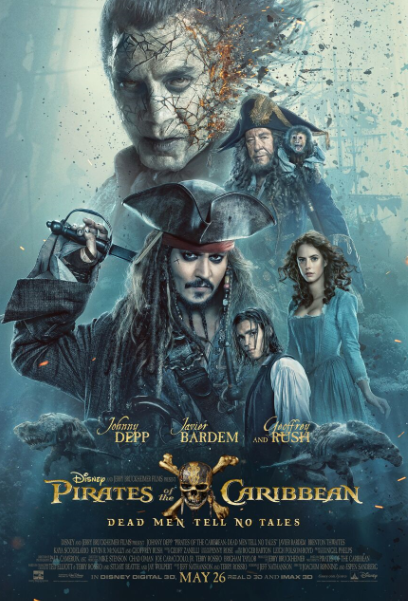 Piratas del Caribe: La Venganza de Salazar también cuenta con las actuaciones de Kevin R. McNally como Joshamee Gibbs, Golshifteh Farahani como la bruja del mar Shansa, Stephen Graham como Scrum, David Wenham como Scarfield y Geoffrey Rush como el Capitán Barbossa. Piratas del Caribe: La Venganza de Salazar echa anclas en cines de Argentina el 25 de mayo de 2017.